This Hella® 200mm Conversion Headlamp takes headlamp performance higher than ever before! Based on European headlamp technology, but conforms to SAE/DOT US standards for street and highway use, it delivers the brightest, most powerful lighting available at the maximum legal limit, without increasing glare. 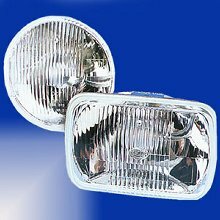 For vehicle fitted with 200mm rectangular two headlamp systems. Replaces H6054. Replacement bulb: 78156 HB2 9003 12V 60/55W. Increases range, cuts eye stress. It produces a 50% more powerful beam on low beam and a 25% more powerful beam on high beam than standard halogen sealed beam headlamps. This produces a greater range of vision for the driver, improves driver safety and reduces driver strain and fatigue. Will Fit: 79-80 Cherokee / 85-01 Cherokee / 81-84 Cherokee and Wagoneer / 81 Cherokee and Truck / 86-92 Comanche / 85-91 Grand Wagoneer / 85 J-10 and J-20 Truck / 88 J10 and J20 series / 79-84 Truck / 79-80 Wagoneer / 87-95 Wrangler. Environmentally friendly design. 2-piece unit with a replaceable bulb to minimize waste and save money.